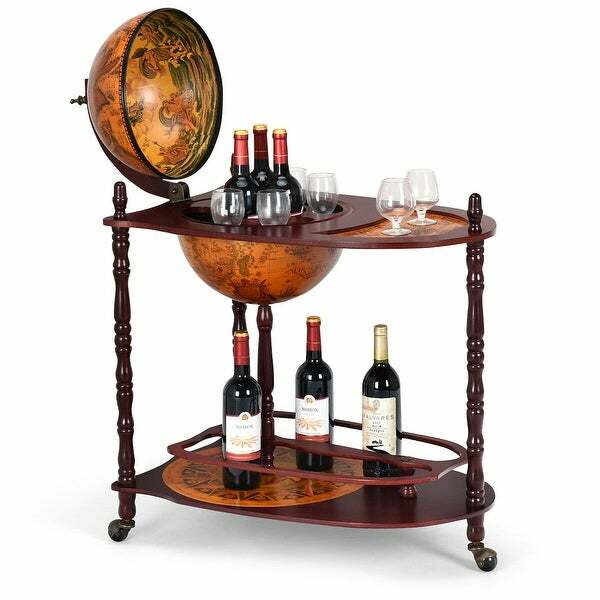 This is our wood globe wine bar stand. It is a Italian-Style Globe Wine Rack, which is ideal for Storage wine bottles and glasses. Its unique outlook will bring highlights to your home and shows your lifestyle. This Italian-Style Old World Globe-Style Bar depicts the natural world upon a deep wood background . The Globe Bar opens to disclose a large rotating bar with plenty of room for your favorite spirits and crystal stemware. It will look superb in any formal setting, while fulfilling a useful function with style and grace! There are also extra platform next to the wood ball for you to storage. The lower shelf also add the storage space. Hurry up and don not hesitate to buy it! It looks beautiful but im 5 foot and it is to my knees. Way to short, looks like kid furniture. Would never recommened it!!!! Very unsatisfied, plus you will have to pay for shipping if you return the item.